Considered by many to be the first American musical, The Black Crook was born in 1866 out of a haphazard union between a hackneyed melodrama by Charles M. Barras and a newly arrived ballet troupe from Paris. The production was billed as the most costly spectacle of its day, taking postbellum America by storm and codifying the outlandish conventions of musical spectacle that defined the genre well into the twentieth century. 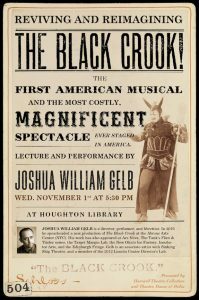 Join Joshua William Gelb, director and adaptor of a recent revival of The Black Crook for a lively exploration of the mythology, scandal, and tragedy of this legendary production. Joshua William Gelb is a director, performer, and librettist whose work runs the gamut from devised physical theater to stylized adaptations of classics and original musicals. In 2016, he spearheaded a new production of The Black Crook at the Abrons Arts Center (NYC) to mark the 150th anniversary of its premiere. His work has also been featured at Ars Nova, The Tank’s Flint & Tinder series, the Target Margin Lab, the New Ohio’s Ice Factory, Incubator Arts, and the Edinburgh Fringe. Gelb is an associate artist with Sinking Ship Theater and a member of the 2012 Lincoln Center Director’s Lab. 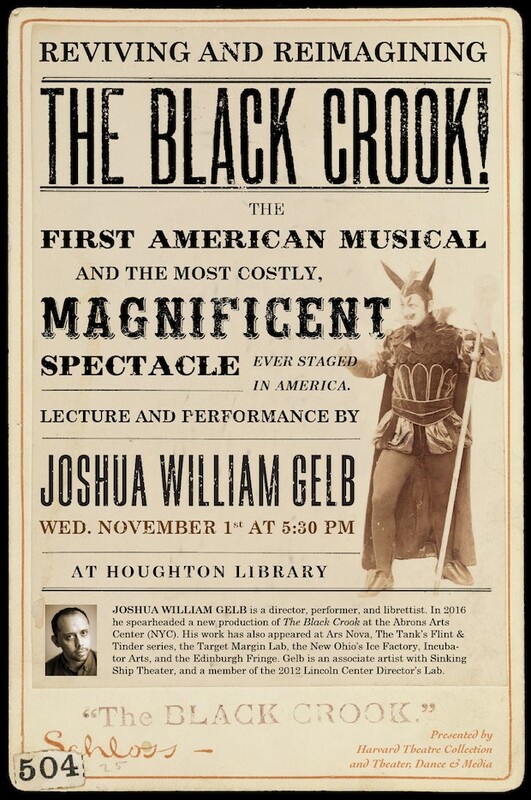 Presented by the Harvard Theatre Collection at Houghton Library and Theater, Dance & Media.